Live, Laugh, Laura! : Girl Scout Cookies (and Memories)! I finally got some Girl Scout cookies…I was anticipating them for forever. They are really good. I hope you get some of your own. I wondered if maybe you could do a blog post about Girl Scout cookies and talk about which ones you love. My sister is extremely creative and when she gets into an idea…she usually has a specific vision for the end product. True to form, her email continued to lay out many of the post's details. The request and all the ideas for the post were great! So told her she should write a guest post. A few hours later her post was in my inbox! Before I give you Leslie’s post, I need to share a few memories of my own (both because she suggested it and because it totally fits here as I write). I was a Girl Scout for a pretty long time. I started in Brownies and actually went all the way up to Seniors (mid high school)…all those years selling cookies with the same troop! I went to Girl Scout day camp at Camp Dewitt, and eventually earned my leadership pin by volunteering a few weeks as a leader at the same place. My first experience away from home at age 11 was summer 1996 at Girl Scout camp where I spent a week three long hours away from home in PA and LOVED it. I credit that experience with being so confident away from home during overnight middle and high school trips, going away to college, and traveling abroad in Australia. I never really experienced the homesickness that some of the others did and I believe that getting to go away to camp at a pretty young age had a lot to do with that! The above was at Camp Dewitt during an overnight camp event called Camporee in 1994. I am on the bottom second from the right. 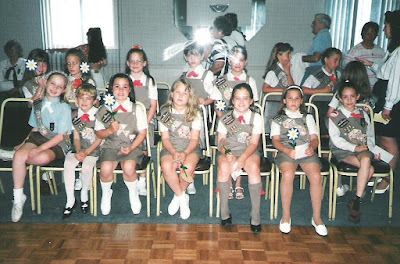 All of the girls and women leaders are from my Brownie Troop, except my sister Leslie (third from the right on the bottom…next to me)…and my dad (I don't think I need to point him out). Yes Dad volunteered to go to this event with Leslie’s younger troop. He was such a great sport having all girls! He coached soccer AND volunteered with Girl Scouts! This was my troop’s cookie sale that same year outside of the local A&P. As you can see (if you purchased a $4 box of cookies this year) the price has gone up a bit since 1994. We all had to volunteer at the stand…but we did four person shifts and this was the only picture in the book I found. I don’t remember the store next to the A&P (the one they are in front of) being such an odds and ends shop…I’m pretty sure it’s a liquor store now. Our troop sold Girl Scout cookies AND Girl Scout Nuts. Around DC, a lot of people don't even know that the Girl Scouts sell nuts…but my mom had purchased some this year from a local Girl Scout so I know they still sell them. I never knew the nuts weren’t as universal because we sold them each year. I was always partial to the cookies though…I think most people are. So without further ado…here are Leslie’s thoughts on Girl Scout Cookies! My run with the Girl Scouts of America was short lived. I took on brownie-hood during the rebellious stage of my childhood. After a year I left having received just as many time outs as troop-achievement patches. Despite the odds, I grew up to be a successful confident young woman. Also surprisingly, I have a serious nostalgic affection/addiction toward girl scout cookies. No, they are not homemade, they are not certified organic and they are not cheap, but they are seriously delicious (plus they're made with real sugar, no high fructose corn syrup). I associate this vice with the coming of spring. At the first sight of a robin hopping in my front lawn I realized my urgent need to contact a local girl scout. If only I had a cell phone number to text. It's hard to find a girl scout if they aren't in your close network of friends and family. I was relived to find an order form left in the kitchen at my workplace. I jumped on it and ordered: 1 peanut butter sandwich (do-si-dos), 1 caramel delites (samoas), and 1 thin mints. In my eyes these are the best of the best. I didn't feel a need to try the newer "dolce de leche" and "thank you berry much" but perhaps I should, considering how delicious the older ones are. I go for the nostalgic ones, although I did pass up on the shortbread (trefoils) which is a great choice. Please vote in the poll for your favorite cookie and comment on why. Its tough for me to pick a favorite but I have to go with the Samoas (Caramel DeLites), they are simply divine. Craving cookies? Me too! Go to http://www.girlscoutcookies.org/ to find a troop selling cookies near you! This year I purchased cookies from two co-workers' daughters…and I was so excited to find people selling them. As Leslie notes, they are not as easy to come by if you don’t have a personal connection! I ordered Peanut Butter Patties, Thin Mints, and Caramel deLights! These are my top three...I used to pick Thin Mints as my absolute favorite...but lately I think I lean more toward the Peanut Butter Patties. I also used to love the Peanut Butter Sandwich but missed that one this year...I might have to switch it up next year. For those of you who are curious about Girl Scout Nut sales…here is an example of an area that sells them (and the products). If you do a bit of google-ing I have seen troops sell them on the internet now since they aren’t sold everywhere. However they all suggest looking for them locally first to support your local Girl Scout Troops. I'll end with two more pictures for good measure! 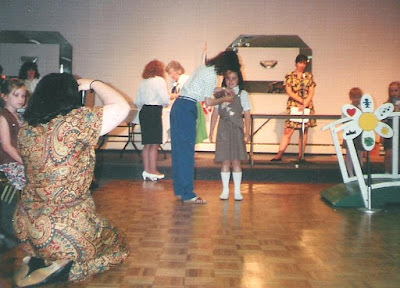 The first is my entire troop at our 1994 Bridging Ceremony, which meant we were going to "bridge" over from Brownies to become Junior Girl Scouts (I'm front row 3rd from the left...and notably more enthusiastic for the picture than some others haha). Next is me getting my pin upon crossing the "bridge"...and my Mom taking my picture...I can't get over her outfit! Thanks for such a great idea and guest post Les! Got any Girl Scout memories you’d like to share? Want to tell us about your GS Cookie tastes? We’d love to hear them in the comments! Thin mints is now second to Tagalongs although that is more recent also. Peanut Butter sandwiches are great with a fresh cup of coffee. Hmm. Time for a trip to the kitchen. Thanks. I have fond memories of selling girl scout cookies, but there were fewer flavors back them. Don't even think they had the peanut butter. The most popular in the 60's were thin mints and shortbread. Enjoyed your blog and photos. Brings back great memories.